Happy Friday!!! Love my Fridays and linking up with my girls, Andrea and Narci. You should join us! 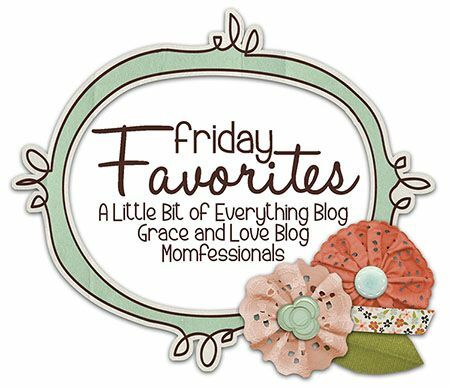 Super simple...blog your favorite ANYTHING and then join the link-up! I think she was trying to cross her eyes...she didn't QUITE get there. :) Last weekend was Tab's first college game of the season. The kiddos and I made some fun plans and had a great time while he was gone. Friday night...we ordered pizza, took baths by 5:30 (not even kidding), and watched movies. Nixon said, "This is the best day ever". Saturday we met some friends at the splash pad for a little food and fun! Saturday night we had some family in town visiting, so we hung out with them. This girl was pumped about going back to school after a long weekend. Somebody else started preschool this year!!! BOWEN! I hadn't planned on sending him, but at the last second...I changed my mind! I started getting information about volunteering in E's class. I want to be able to do that. Bowen was at home with me a couple days while the big kids were with friends and he was SO bored alone. Like follow me everywhere I go kind of bored. PLUS...he's SO used to being with at least one of the big kids that he hates being on his own. Tab and I agreed it would be great for him. FINALLY...I got this!! Just in case you were wondering what toddler size "Extra-Wide" shoes look like...there you go. Yes! Who knew they even made "EXTRA WIDE"?? haha!! Seriously...this sums up how they were both feeling. This shirt just arrived for Bowen and he's going to rock it! Loving the stripes!! I'm a sucker for a cute football shirt in the fall. 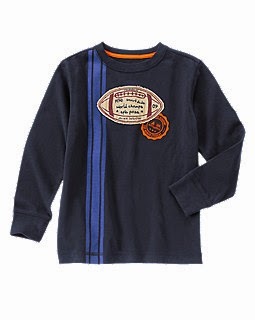 Right now Gymboree has a cute line of football clothes and they're on sale!! This shirt is $11.94! That's all my faves for today!! Have a GREAT weekend!! Woohoo! What a fun week you guys had! Sweet Bowen at school just melts my heart. He is precious :). Aw, your little blondies are just the cutest ever! Have a great weekend and thanks for hosting the link up! They make extra wide toddler shoes?!?! I need some. My kid has super wide feet! Traci...YES!! I didn't know either!! But..I had him measured at Nordstrom earlier this summer. The shoes they had available in extra wide were NOT my fave. During the anniversary sale, I saw these grey New Balance came in extra wide so I snagged a pair! The picture of the kids before church is soooo cute. And my goodness Ebby Lee looks SO GROWN UP!!!! What a fun week! Xavier is always bummed about going to school, but then once he is there he loves and doesn't want to leave! lol! Love those tops for the little guys! And I am totally a sucker for all things football. 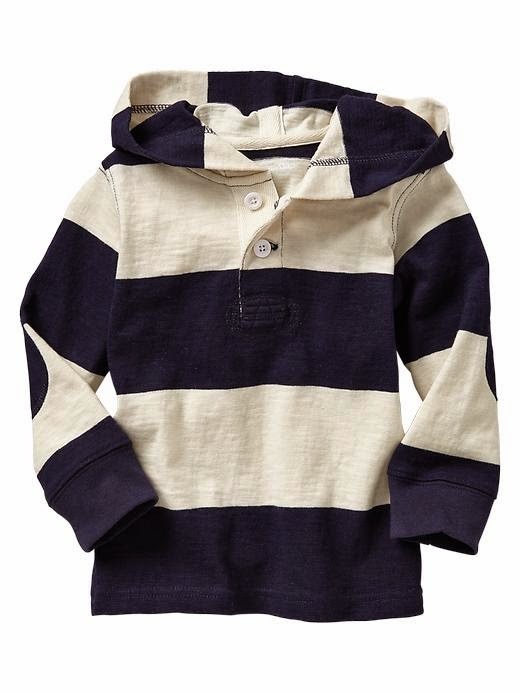 Heading online to Gymboree now! lol! They look adorable in all their back to school clothes!! Where did you find the owl pillow on the bench? I'm so obsessed! Thanks for hosting the link up! You have such a precious family - your kids are adorable! Too cute! Where did you get the owl pillow on the front porch?? Extra wide shoes! Where did you get them. I have had to take back every cute pair of Nike's because I think my son has the fattest feet ever (I LOVE them!) Stride Right are the only shoes I could find and the are not so cute and super pricey. Sara...I got them from Nordstrom! Good luck girl! I totally understand! You have the most adorable kids!!! I also must say you sound so calm about having three children by yourself ALL weekend!!! By the weekend, I am always glad to have an extra pair of hands from Daddy, and I only have one kid right now!!! Your kids are just darling!! And horray for a great first week of school. By the way--my 1st grader has that same PB green and white striped backpack and it has held up great for over a year!